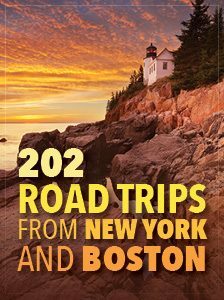 The beauty of Long Island’s North Fork is best experienced on a bicycle as part of a bike tour. An open road on Long Island? You betcha! 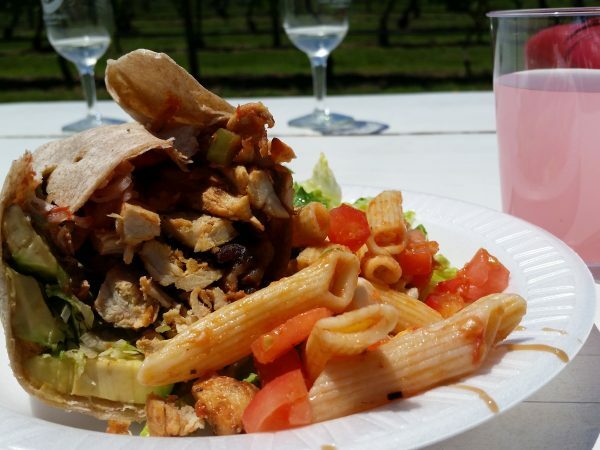 Eight different wines, 12 miles of cycling and enough rural beauty to satisfy anyone’s eco-appetite: I contend that the beauty of Long Island’s North Fork is best experienced on a bicycle as part of a bike tour. 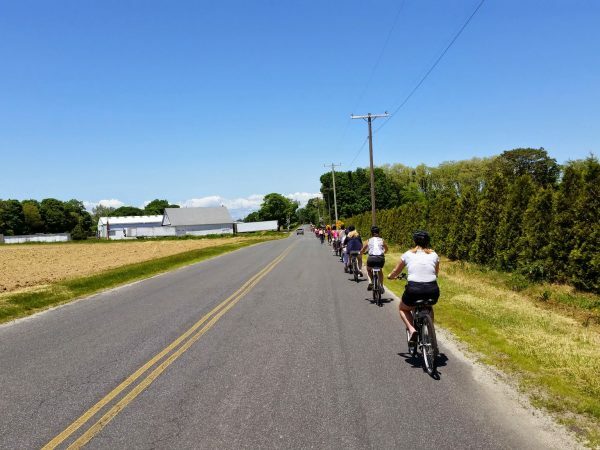 I met up with my 30-or-so cycling buddies for a ﬁve-hour guided bike tour of North Fork vineyards with East End Bike Tours. 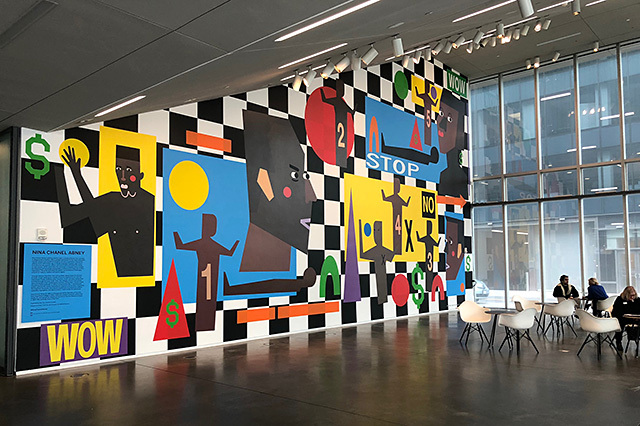 (Tip: I purchased my tour through a popular online discount site for more than 50 percent off!) We met approximately 13 miles northeast of where the Long Island Expressway ends (or is it begins?). After a quick bike-ﬁtting (yes, size does matter if you want to enjoy the ride) and a safety brieﬁng, we were off and pedaling through wine country. Tour guides wearing reflective vests bookended the parade of cyclists, answering questions and helping with any equipment difficulties along the way. There was even a support vehicle tagging along in the distance in case someone needed to drop out. But it was a relatively easy bike tour, even for a beginner. During my tour, with participants between the ages of 21 and 70, no one seemed to have an issue. Bike tour participants ride in single file. The trek began along Mattituck’s Main Road, which – as the name suggests – is quite busy. However, within minutes we ducked down a bucolic side road and skirted along Great Peconic Bay, the body of water that divides the East End into the North and South Fork. The congestion and mall shopping that often deﬁnes our island quickly faded from consciousness, enveloping me in sweet serenity. Working our way into the hamlet of Laurel, we came upon our ﬁrst stop, Laurel Lake Vineyards. We dismounted and sat at a reserved section of picnic tables where a buffet of wraps, salads and drinks awaited. After ﬁlling my belly with a delicious Santa Fe chicken wrap and some fresh mozzarella and pasta salad, I footed myself to the top of the vineyard’s two-story deck. A light lunch between stops. Yes, that’s pink lemonade! Don’t be deceived; on the North Fork, a two-story view makes you feel like you are on top of the world. After all, this is farm country, and the vineyard view was picturesque. All this joy and excitement and I hadn’t even had any wine yet! “Swirl, smell, sip and spit,” our tour guide recommended. There was a collective secret wink among the group that said “yeah, right,” yet we had an absolute understanding that overindulgence was not an option. Not just for safety reasons, but to also avoid the embarrassment of being unable to complete the bike tour. 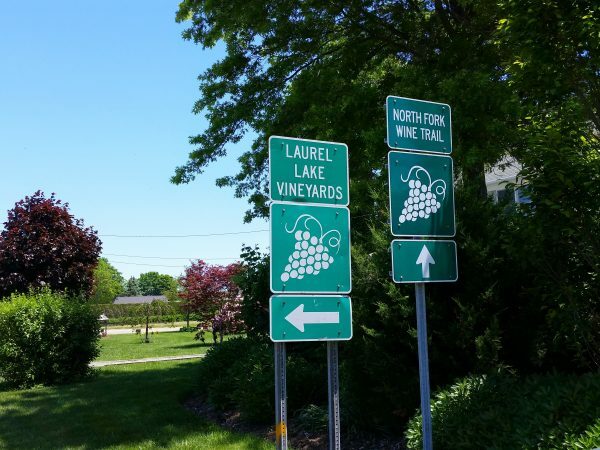 Laurel Lake Vineyards delivers expansive views and an impressive portfolio of wine. I am no sommelier, but I can tell you the best pairing was the warm sun and blue sky with the cold sauvignon blanc. Bursting with flavors of grapefruit and lime, the wine was refreshing and alive. After a few more tastings we hopped back on our bicycles. 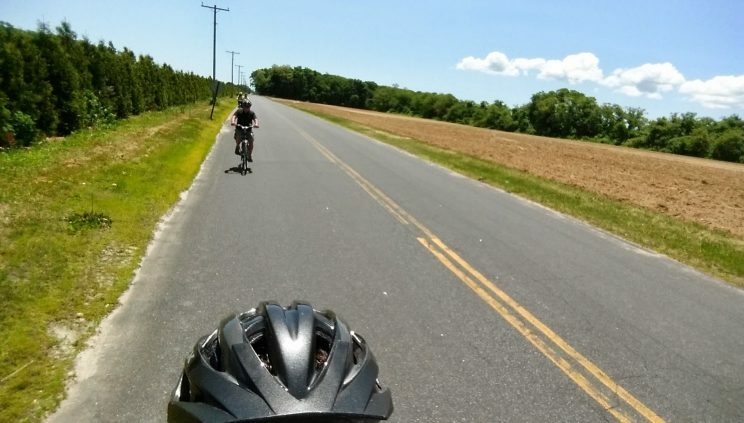 We headed north toward the Long Island Sound, riding a couple of miles alongside Half Hollow Nursery, which features more than 600 acres of plant life and is home to the highest wind turbine on Long Island, standing at an imposing 156 feet. The tempo on the North Fork is such a departure from the rest of New York that the irony of speeding through it on a bike can’t be lost. The ﬂat, smooth asphalt helps create a biker’s paradise. The next stop on our bike tour was Martha Clara, the family-friendly vineyard owned by the Entenmann family (yes, the cake people). Like many vineyards here, the parcel was once a potato farm. Located on Sound Avenue in Riverhead, the stop included an extra-virgin olive oil and vinegar sampling. The crusty bread came just as we were about to taste four wines. Perfect timing. 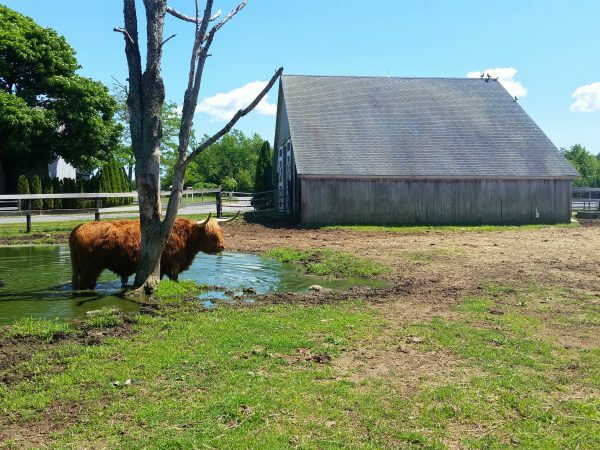 Martha Clara is home to a number of farm animals, including a group of Scottish Highland cattle. The pastoral surroundings of the North Fork make it feel almost criminal to step indoors, but Martha’s expansive indoor barn-style tasting room beckoned. With a vaulted ceiling and adjacent gift shop selling every conceivable wine accessory ever made (who knew a corkscrew could look like that? ), it’s worth the trip. Helmet back on, we were off again, this time pedaling along Sound Avenue, one of the main arteries running through the North Fork. In single ﬁle we made our way to Harbes Family Farm back in Mattituck, which offered us hand-picked veggies and my favorite farm stand treat, sugar-dusted apple cider donuts. 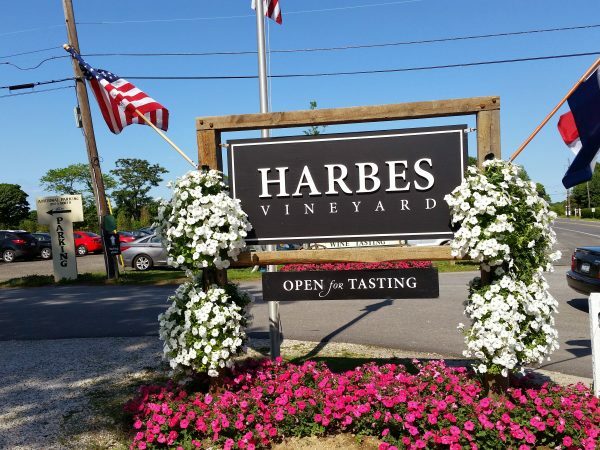 Harbes Farm is a 13th-generation farm that delivers family fun year-round. 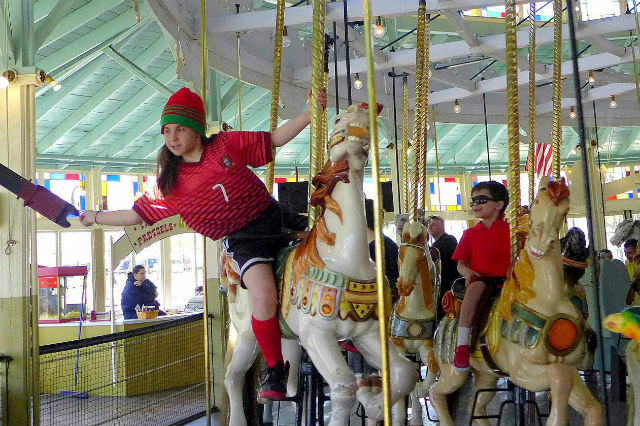 While we didn’t partake in the farm’s Barnyard Adventure, this kid-friendly venue offers up an array of animals, activities and games sure to please family members of all ages. And the free samples of farm-grown strawberries and fresh whipped cream were delightful. The charm and beauty of the North Fork can’t be overstated. The purity of the air and unencumbered views make it a must-visit – especially by bike. And when traffic backs up during the peak summer and autumn season, be sure to wave as you coast by on two wheels. That’s part of the beauty of biking. Did you know that AAA Northeast offers bicycle service if you break down while out for a spin? Click here to learn more. 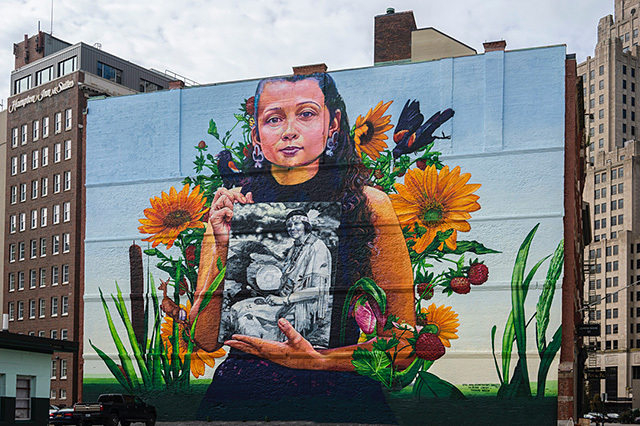 Article tags: AAA, AAA Northeast, bicycle, bike, bike tour, cycling, east end, home, kid friendly, lunch, north fork winery, northeast aaa, safety, tours, trek, trip.